After failing in the first round in back-to-back seasons, the Toronto Maple Leafs come into the season looking for more. 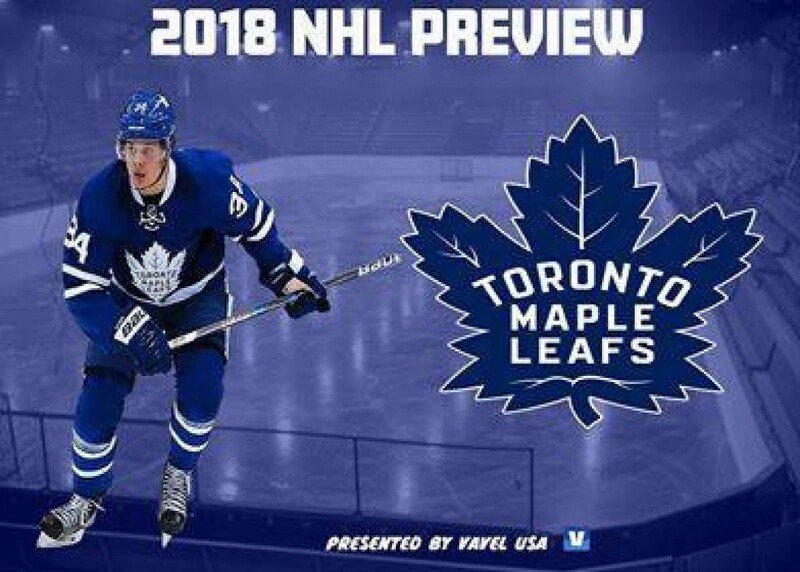 BThe Toronto Maple Leafs had another season of progress in 2017/18. They finished third in the Atlantic Division and pushed the Boston Bruins to seven games in the opening round. Auston Matthews had another good season but did deal with injuries. Mitch Marner also led the team in scoring and is primed for a big year. The Leafs also had some young talent take a big step. Travis Dermott emerged as a top-six NHL defenseman, and Kasperi Kapanen emerged as a future star. The Leafs struggled to stop their opponent from getting shots at goaltender Frederik Andersen. They allowed the most shots on goal and they allowed over 30 shots per game last season. Andersen slowed down in the playoffs with a .889 save percentage and allowed 3.76 goals a game. Frederik Anderson is one of the best goalies in hockey and just needs some help on the back end. The Toronto Maple Leafs landed the biggest free agent in NHL history. John Tavares left the New York Islanders after eight seasons with the team. He signed a seven-year contract for $11 million annually. He has become one of the highest paid players in hockey. He had over 80 points last season and the center ice position is now loaded for Toronto. The addition should allow Auston Matthews to match up with the second defense pair in most contests. Toronto also made some depth signings. They signed Tyler Ennis, Kyle Baun and Adam Cracknell to one-year contracts. They should all be vying for roster spots in training camp. Frederik Gauthier and Connor Carrick also re-signed with the club. Gauthier will be vying for the fourth-line center spot with the loss of Dominic Moore. James Van Riemsdyk is heading back to the team that drafted him, Philadelphia. The Flyers signed him to a long-term deal for $7 million annually. Tyler Bozak also left the club. He signed a three-year contract with the St. Louis Blues for $10 million. He was a mainstay on the team and was a leader of the Toronto rebuild. Leo Komarov and Dominic Moore also left the team. Komarov signed with the New York Islanders and Dominic Moore is still a free agent. He could be a pro tryout contract option as training camp nears. - Morgan Reilly emerges as a top pair defenseman and plays huge minutes for Toronto. - Frederik Andersen has another great season and is involved in the Vezina discussion. - Patrick Marleau has another 20-goal season at the age of 39. - The center ice position is too loaded and players begin to bicker over ice-time and power play minutes. - Auston Matthews continues to have injury woes and misses significant time. - Morgan Rielly does not take the next step and Jake Gardiner continues to struggle. - Frederik Andersen has a lot of wear and tear and fatigue sets in for the netminder. The Leafs have one of the deepest forward groups in the NHL. John Tavares and Auston Matthews are both elite centers and should create tough matchups for opposing teams. They need to re-sign Matthews, Mitch Marner, and William Nylander. They will be UFA's next summer and will be looking for big paydays. I see the team being one of the best in hockey and having good battles with the Tampa Bay Lightning and the Boston Bruins the entire season. They should be in the second round at least and are legit Stanley Cup contenders. They are going to be fun to watch. Do you agree that the Leafs are Stanley Cup contenders? Let us know in the comment section below and be sure to give us a follow on Twitter by searching (VAVELNHL_ENG).